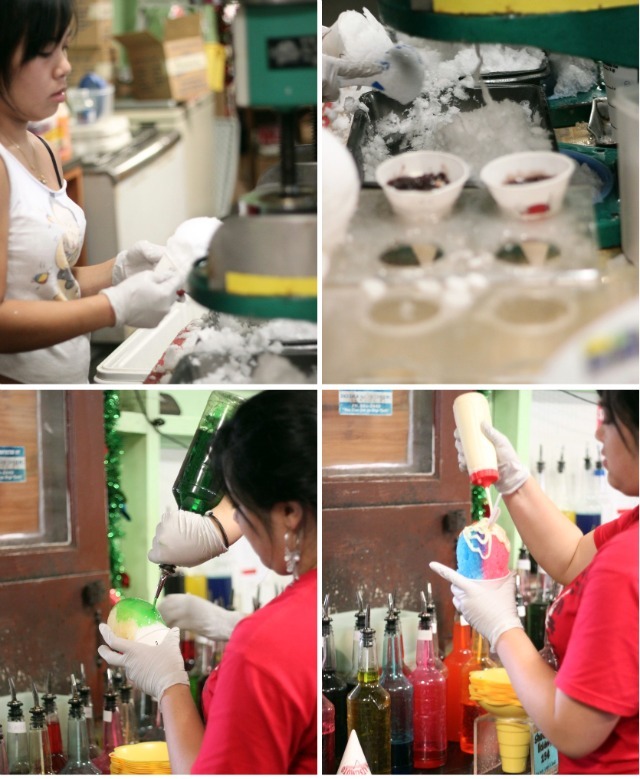 Shave Ice is the flavah of Hawaii. Every place has their special food, the one you must try when you visit. I know, I know, shave ice is pretty ghetto with it's chemically engineered unnatural flavors. Enzo, what flavor do you want? "I'll take the blue, purple, and red, actually make it a rainbow"
Most people ask for the rainbow. with sweetened condensed milk on top, of course. The first time I had Shave Ice at Matsumoto I totally didn't get it. There was traffic getting to the store in Haleiwa, bad parking, the line was long, and I ended up with a bad brain freeze and a subsequent headache because I went all out and ordered a large which in Hawaiian term means you're-ridiculous-if you-even-try-to-eat-all-this-by-yourself. Failure. Now I go back over and over again because Matsumoto Shave Ice brain freeze is what it's all about. Along with the traffic through the North Shore so that you can check out the waves and the Japanese tourists, the long line so you mingle with strangers or more Japanese tourists, the sticky flavors and the ice that melts way too fast and drips down your legs giving you the perfect excuse to jump in the ocean. I love Matsumoto Shave Ice. I also love that they have a website. The picture on top that shows the outside of the store is a lie, don't believe them for a second. There is always a long line outside the store I promise. The middle picture, that has the poster boards with the different flavors, is true. It looks exactly like that, with old flavors crossed out in black sharpie. It's awesome. I wish I could give you a Matsumoto Rainbow flavored Shave Ice but really you need to go to Hawaii and experience it for yourself. I did pick up a bag for you though. I thought of getting a t-shirt or a hoodie but how am I supposed to guess your size?! Impossible. So a Matsumoto Shave Ice tote bag will have to do. Giveaway closes: Midnight PST Friday January 7th. The winner will be contacted via e-mail and announced next Saturday. post-edit: Comment 23 was randomly selected. Congratulations to Kimmie from Full Circle. I hope you enjoy the bag but most importantly I hope you get inspired to visit Hawaii one day! I may live in Hawaii and in the vicinity of said Matsumoto's. It would be so awesome to get a tote bag! That being said, I'm a Google follower! I think having shave ice was Ryan's favorite part of our honeymoon, LOL! I am a follower. Happy New Year! Hi, could you send a little of the warm sunshine along with it? I love those shaved ice, they always make me think of summer. Shaved ice sounds just delicious. I guess I have to put Hawaii on my list of places to go (as if it weren't already there). Happy New Year, Damaris -- I hope your 2011 is filled with lots of happiness, love, and blessings. I also follow you on Twitter and Facebook. I am a follower. I love how bright these treat are! Hope 2011 is treating u well. How lucky you are to be in Hawaii! 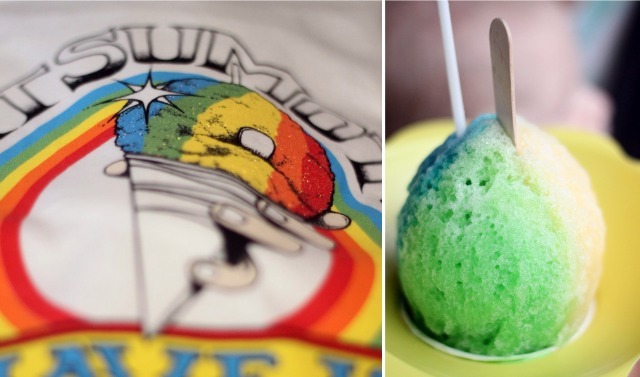 I would loved to try the shave ice. Fun! I hope you guys have a great time. Happy New Year to you! Hi! I follow you everywhere (does that make me a blog stalker?!)! Via Google Reader, Twitter,email etc. Hoping you had a great vacation! Hi, I'm a follower! Love your blog! Now I follow on FB also! Hi! I am a new follower! Thanks! 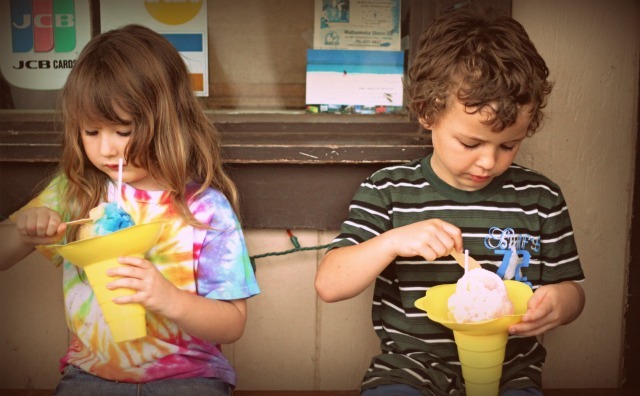 Love those shaved ice...and Hawaii too! :) Hope you had a nice vacation there. I'll pass on the t-shirt cause I got plenty.....but yeah...always a long line. and yes its worth it! I always get melona or lychee. my fav! I haven't been for months and we live around the corner! I guess I just don't want to stand in the line unless we have people visiting! But yes. Matsumotos = oh so yummyness! I am headed to Hawaii in two months, but Maui and not Oahu ... Do you know if there is there anything similar there I should check out? Because these look great. are you in Hawaii! I am so jealous ahhhh. Get me out of the cold! they pour the sweetened condensed milk on top of the shaved ice in CR too. soooo delish! can you tell i really want this tote? haha. i go crazy for them. Ohh how lucky you are to have experienced how lovely Hawaii is!!!!!!! I know you and your family enjoyed yourselves!!!!! I am a New Follower and so glad I found your Blog!!!! Just signed up for your email subscription!!!!! I have to say, shave ice alone is all the inspiration this girl needs to visit Hawaii! I'll start saving, and then come to you for advice on things to see and eat!